Clean Eating is simply eating clean, lol. I feel clean eating is when your meals are devoid of processed foods. Processed foods are the natural foods that are already manipulated. Some materials are either added or taken away to distort their naturalness either for convenience or preservation. For example you can have rice processed or leave unprocessed, the same way fish can be processed or unprocessed. The bottom line is that, for every processed food, there is an unprocessed version of it. So when you want to eat clean according to ME, it's when you limit to the barest minimum the number of processed foods you take at a given meal. For me, a processed meal could be canned beans taken with bread and a glass of orange juice. hmm yummy! 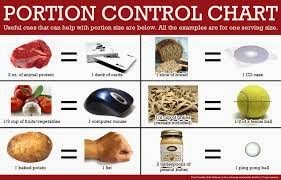 Portion Control is when you serve food within a calorie range that is healthy for you. It is when you keep the proportion of foods taken at a given time within what your body adequately requires. Mark the word "requires" and not "desires". In fact most of the time our bodies desire more than our bodies require and that is when we gain the excess weight and fat deposits. The relationship between clean eating and portion control is this: you could be eating clean with a distorted portion (i.e. uncontrolled portion) and the aim is yet defeated as weight gain is still imminent. On the other hand you could be taking only processed foods but with controlled portion in mind and you are losing weight steadily. Implications of the latter is that you are losing weight but you are not healthy because added sugars, added salt and unhealthy oils are finding their way into your system and of course this is not good for you. The former also establishes the fact that eating clean does not mean carelessness or the chance to overeat as this brings on the excess weight and still not good for the body. What do we do? Eat as clean as you can and make sure to control your portions. Point of note that there are some foods that needs to be processed to make them really clean and edible e.g. milk, it needs to be pasteurized to remove harmful bacteria, and also oil must be pressed out of seeds. Some fruits are froze so that we have can them all year round. With all these in mind, we have the liberty to chose and know what we want. Stay healthy friends, learn to make at least 85% of your meals from scratch so that you can control the salt and sugars added. Some Guidelines to choosing right even when doing the processed thing.